Upon completion of his Naval Flight Officer course, as he was flying is certification mission as LT. John Sheridan's radar intercept officer, the exam became more real as they were engaged by a NVA MiG 21. The ensuing air encounter resulted in the MiG's destruction. Mission report below. 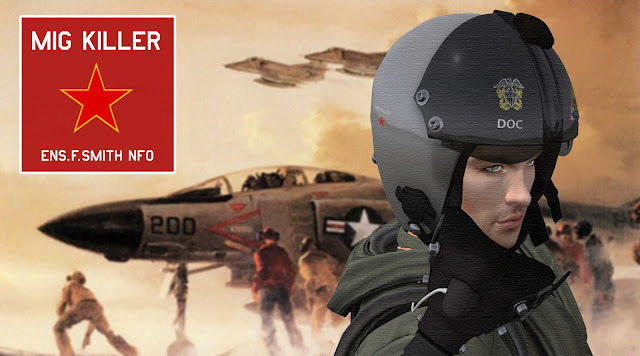 He has earned the first MiG killer star on his helmet. Congratulations on the achievement of your NFO qualification and on your first MiG kill, Ensign Smith. Hooyah! The USS Kitty Hawk radar crew spotted an enemy MiG 21 Fishbed heading towards South Vietnam borders where our Marine troops were stationed. where we spotted the hostile aircraft preparing to engage our grounded troops when Lieutenant Sheridan did an swift maneuver placing the F-4 on the hostile MiG back giving myself a chance to lock-on the AIM9 Sidewinder that hit the MiG's engines setting it on fire. A few moments later we noticed the MiG pilot ejected and the plane crashed on Phu Yen proximity. It was a confirmed kill. click the picture or here for details! This class is taking place today at 1400 hours. Coming close to another Independence Day, I decided to pledge publicly to my Fleet and the United States Navy SL while sharing how I see the United States Navy role play in Second Life. So to start with, and to make absolutely clear where I stand, I pledge my loyalty to the United States Navy SL and her Third Fleet and my commanding officer, RADM Isaac Levitt Harcassle. I was one of the senior officers who proposed and endorsed his promotion to Admiral and would do it again in a heart beat. RADM Harcassle is doing a great job as our Fleet commander as well as the coordinator of USNSL efforts to bring more and more USN inspired groups into the fold. So my loyalty is first and foremost to the structure I am part of, its command and its members, from RADM Harcassle to the last MIDN to be inducted into the Naval Service Training Center. We move as a whole, following directives we all in one way or another help put together - from senior officers in command meetings to even midshipmen while taking their classes, we all participate and contribute to establish these directives in different but equally important ways. This means, of course, the directives are in place for the benefit of Third Fleet. Now what does this mean in the global USN role play in SL setting? So far, and as part of RADM Harcassle vision, USNSL group has been and is still used as both an operational and an informative/formative group. Operational groups are 100% in character groups (ICG) while informative/formative groups are a mix of ICG and out of character groups (OOCG). There is no real distinction at the moment between USNSL and Third Fleet in this vision, however, with the most welcomed incorporation into USNSL group of more and more USN role players from other USN inspired groups from all time lines, this situation poses a number of problems in my view. Having operations and informative/formative roles in the same group is confusing. Case in point, the separation from USNSL of NSTC. NSTC is a mixed ICG/OOCG however it is confusing enough to have Officer Candidate School (OCS) and Recruit Training Command (RTC) related chatter and notices in other groups. This is a local example of the benefit of separation even between 100% ICG's. When it gets to USNSL and the myriad of USN inspired group members in it it gets even more beneficial. Take USN 7th Fleet. You never see a call to arms, a scramble or any action related communications on USNSL channels, be it group chat or notices, and that is correct. 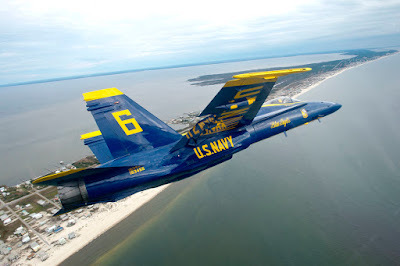 For a LTJG doing OOD duty at NAFA, the fact that a NVA Mig is flying too close to the Kitty Hawk is irrelevant, as it is irrelevant for a Marine pilot about to take off from Phu Yen that the Blue Angels are taking NAS Miramar for practice. Those are local operational matters that do not belong in a OOCG, especially one that aggregates so many different types of USN inspired group members. We do see USN 7th Fleet related notices and group chat messages in USNSL related to events or classes and that is perfect - the informative/formative role. We also find out when something relevant in operations has happened or will happen in the various groups that justifies a general notification, such as an outstanding action in the line of duty, an event worthy of mention, classes open to all USN inspired group members. That is the "News" aspect of the informative/formative role. And to me that is what USNSL group is for. Recently I proposed to RADM Harcassle the creation of a 100% operational ICG for Third Fleet. Exactly as 7th Fleet has. That allows us in Third Fleet to have our operations separate from the other USN inspired groups in terms of real time operational events. This will aggregate all unit, station and facility group members in Third Fleet, leaving USNSL group as a pure informative/formative group that gathers all USN inspired groups willing to become part of the USN role playing community in Second Life in an organized fashion, working together towards a common goal, learning from each group experience and sharing more and more common traits as we move forward - from codes to career progression to knowledge acquired and how to learn it. In a nutshell, operational groups are mainly real time operations with dedicated operational based information and formation, while informative/formative groups are mainly "news groups" where you find general interest matters covered in character as well as out of character but always in a global fashion. Gathering students and attendees for an upcoming open class or announcing a relevant event like an airshow falls into both categories, operational and informative/formative, while scrambling pilots to search and rescue falls into the operational category only. Do I believe all USN inspired groups should be represented in a Mother Group such as USNSL group? Yes I do. Is that even possible? No it is not. Should it be attempted in the hope that many like minded people role playing USN inspired parts have access to a global view of what is going on with similar groups? Absolutely. Yes. This is my view: A large all eras and branches United States Navy inspired group gathering people for informative/formative purposes only, leaving the 100% operational/action roles to the 100% in character groups. Much like the real life navy we portray, ICG's can have directly affiliated sub-groups - Third Fleet has several, like NSTC and NASM. ICG's sharing common or overlapping timelines/eras can have joint operations (CVN-63/7th Fleet era overlaps NAS Miramar's, for example). Others would just have joint informative/formative events (NAS Firespire is WW2 and much as I like the idea of Tomcats fending off the Zeros on their way to Pearl Harbor, that's not a day to day scenario we can role play consistently). So there you have it. This is how I would like to move forward. It is my view. Of course it would require adaptation and adjustment, but so will any form of cooperative effort that has the purpose of gathering like minded role players in USN inspired groups all over Second Life, no matter what that form is. To end much in the same way I started this open letter of sorts, let me place the emphasis on my loyalty to Third Fleet and its command and members, and remind readers that this is food for thought that hopefully will get us all thinking of ways to better cooperate and act in a United States Navy inspired environment in Second Life. As commanding officer of one of Third Fleet's stations I am bound by honor and duty to my command structure and my path will always follow the path of the Fleet I serve in. Go Navy! Hooyah! CDR. Asra Kron and our one and only CPO Black demonstrating the NWU / ACU at the main gate. 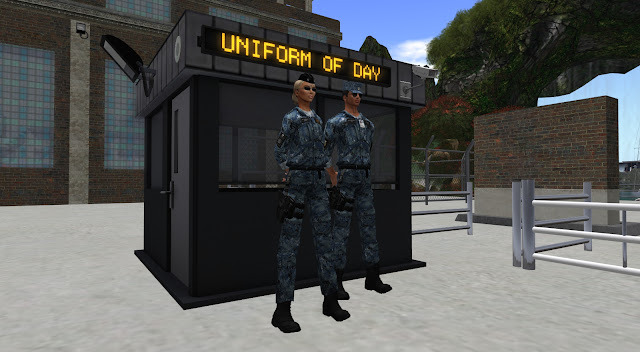 There are several status notices displayed on both sides of the guard house by the main gate at Miramar - on the electronic boards placed on each side - and one of them is the "Uniform of the Day" status. Used to get us all on the same page upon arrival at Miramar, you should check the board and gear up accordingly. Obviously, pilots and flight officers can use their flight suits at all times unless attending official events in and out of N.A.S. Miramar. If you are not flying use the prescribed uniform of the day. The extended periods to which a uniform of the day apply serve the purpose of getting new arrivals who do not yet have their uniforms up to Miramar standards set up to speed. If you are one of them, seek a senior officer for guidance and take the opportunity to get your uniforms sorted out and saved correctly as outfits. Direct any questions to your CO. So you are out of OCS and you have your Basic Flight done... And you ask yourself "Are we there yet?" The answer is simple. No, you are not. Not yet. But you are getting there. The Wings of Gold are granted to an elite group of pilots who can become Naval Aviators. It takes training and dedication to earn your wings, but if you're dedicated to a career as a pilot, it's a good long term goal. When you enroll with Third Fleet you will go through Intermediate Flight Training (IFTR) at N.A.S. 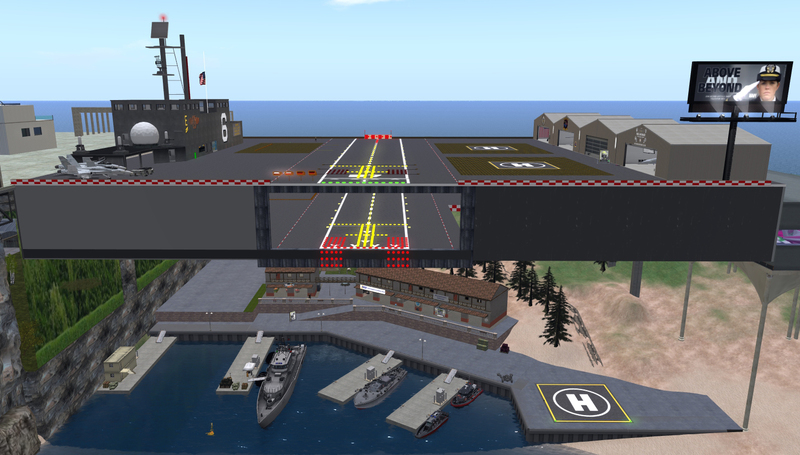 Miramar - This will allow you to go through more specific training in fixed and rotary wing aircraft and give you more advanced notions of flight theory in SL which you then proceed to apply in your active duty squadrons. If you are a jet pilot, then you will need Carrier Ops Certification, which we share with 7th Fleet, along with a number of advanced classes in flight (AFTR), such as formation flight which you will get through your service with your squadron. In addition or alternatively you may choose the Naval Flight Officer's path (NFO), which will allow you to operate the other systems of rotary and fixed wing aircraft - RIO, Co-pilot, Navigator, SAR operator, etc.) That is another program altogether, and a very needed one. You should consider the Naval Flight Officer option leaving OCS. Every Maverick needs a Goose. 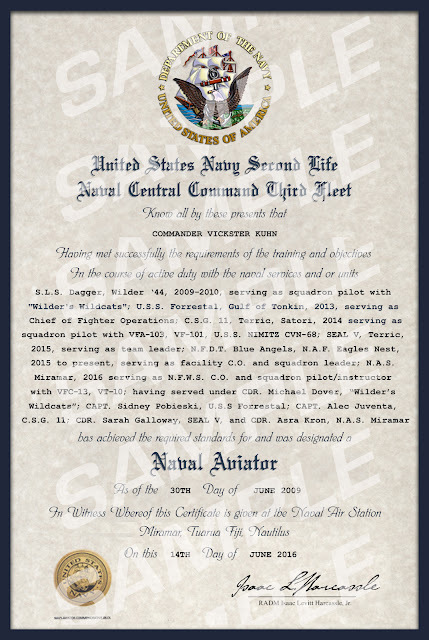 Left to right: Naval Aviator short form, Naval Aviator Fleet and Naval Flight Officer short form certificates (SAMPLES). So the question begs to be asked: "What if I was already flying Navy before? And I have no certification?" Chances are you do. Send your naval record to Admiral Isaac Harcassle. Make sure you include your deployments by years and commanding officers by units and also the date on which you were assigned active flight status with a USN squadron as carrier pilot, NFO, rotary wing pilot or propeller aircraft pilot. Fleet will examine your case and if you have a naval record that justifies it your Wings of Gold cert will be issued retroactively, what we call a Naval Aviator Retroactive Certificate. That will give you proof of your Naval Aviator status. This is valid for experienced OCS attendees who served in the past and currently active duty Third Fleet officers O-3 and higher. 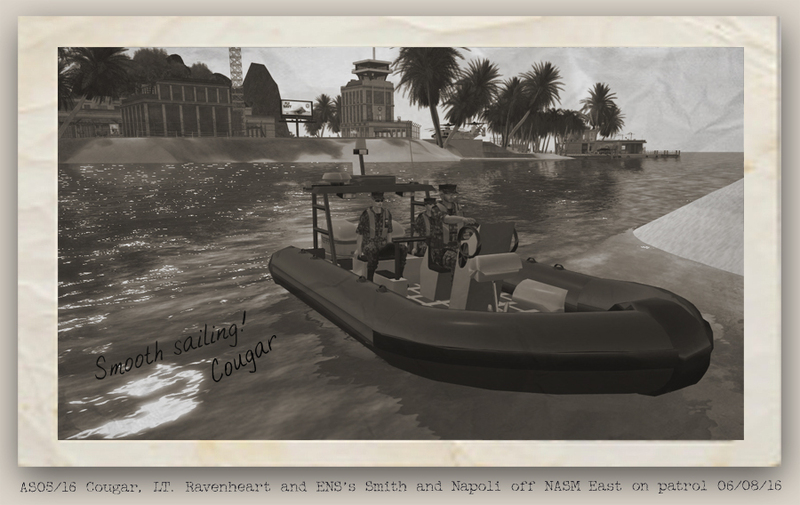 Want to find out more about IFTR and AFTR requirements send your inquiries to Naval Air Training Command (N.A.T.C.) at N.A.S. Miramar - to the attention of LTJG. An Rainbow. More to come on this subject. Stay tuned. CDR. 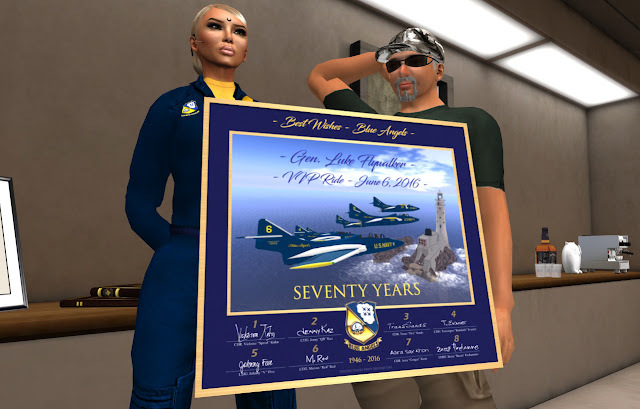 Asra "Cougar" Kron, Angel 7, presents Gen. Luke Flywalker his V.I.P. Ride certificate after his Blue Angels flight. The Blue Angels must be doing something right. Following the inspiration from the real life NFDT acting as ambassadors to U.S.N.S.L. and raising awareness to the institution and its roles, we caught General Luke Flywalker's eye and he proposed to do a shoot at Miramar for SL Aviation Magazine. He had already filmed the Blue Angels at the CinSal airshow at Agrippa, on May 14, for SL Aviation Magazine number 46 (see here). More on this as the N.A.S. Miramar issue is released. After the tour, General Flywalker was given a V.I.P. 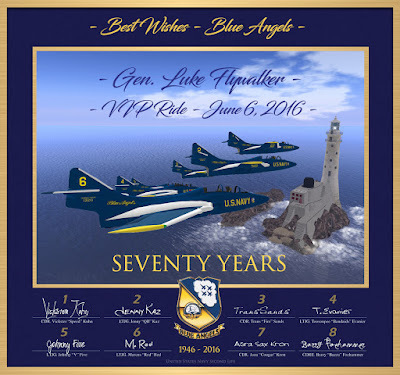 Ride aboard Blue Angel 7, flown by CDR. Asra "Cougar" Kron. He was the first to take an official V.I.P. Ride and the first to be presented with the respective certificate - which this year is a special 70th Anniversary edition. The United States Navy SL, N.A.S. Miramar and the Navy Flight Demonstration Team wish to extend their gratitude to General Flywalker for taking an interest in their activities and for making them known to the general public through SL Aviation Magazine. Thank you, Sir! See SL Aviation Magazine issue 48 here. Naval Air Facility Avignon (NAFA) approaches full ops capability. 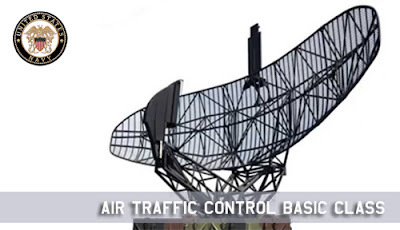 Captain Alec Juventa has sent out NAFA's new ATC rules for fixed and rotary wings. Location region Avignon - Eastcoast Satori. On June 5, Class 5 of 2016 graduating officer candidates took the oath of service and became naval officers. Two officers from this class are now deployed at NAS Miramar, Ensign Francis A. Smith and Ensign Sephiria McCloud, both have already reported for duty. The Blue Angels performed the usual fly over at the beginning of the ceremony as the national anthem was played, but this time in lieu of their usual diamond break and dirty section high alpha passes executed with their current Grumman TF-9J Cougars, they flew the F/A-18 Hornets on a single pass three plane finger four missing man formation to honor USMC Captain Jeff Kuss, real life Blue Angel 6, killed in a tragic accident during a NFDT practice over Smyrna, near Nashville, on Thursday, June 2. Alpha Pass maneuever on Dec. 2, 2015. 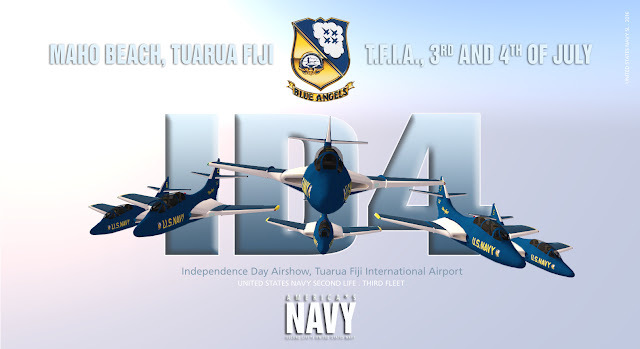 The four Blue Angels took off from Southern Cross Airfield, next to the Naval Service Training Center at Velinissimo and as they approached the parade where the grad ceremony was being held, LTJG. Johnny "V" Five flying Angel 2 left the formation on a vertical break leaving the empty slot observed during the fly over. Flags at USN SL stations and facilities are flown at half staff until June 9, in remembrance of the fallen Blue Angels pilot. 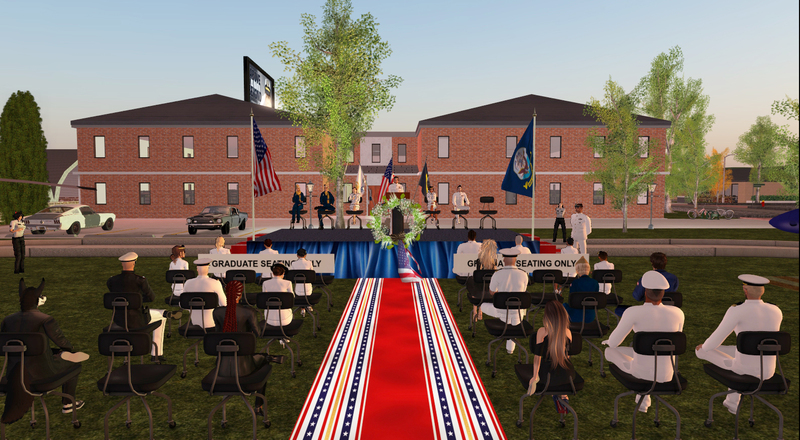 We wish all the graduates from Class 5 of 2016 all the best in their careers and hope they will help maintain the high level of commitment and service all naval aviators and officers uphold, in the best United States Navy tradition.